The Unicorn in Captivity is a very famous image. Just about everybody has seen a print of it. It's one of seven "unicorn tapestries" held at the Metropolitan Art Museum in New York. Every image in medieval art is likely to have a meaning -- sometimes multiple meanings. The museum notes do a good job of pointing out the complex symbolism in the unicorn itself and its surroundings. Before you read them, though, see if you can figure out what the little red dots along the unicorn's neck are. Look just below the collar. The seven individual hangings known as "The Unicorn Tapestries," are among the most beautiful and complex works of art from the late Middle Ages that survive. Luxuriously woven in fine wool and silk with silver and gilded threads, the tapestries vividly depict scenes associated with a hunt for the elusive, magical unicorn. "The Unicorn in Captivity" may have been created as a single image rather than part of a series. In this instance, the unicorn probably represents the beloved tamed. He is tethered to a tree and constrained by a fence, but the chain is not secure and the fence is low enough to leap over: The unicorn could escape if he wished. Clearly, however, his confinement is a happy one, to which the ripe, seed-laden pomegranates in the tree—a medieval symbol of fertility and marriage—testify. The red stains on his flank do not appear to be blood, as there are no visible wounds like those in the hunting series; rather, they represent juice dripping from bursting pomegranates above. Many of the other plants represented here, such as wild orchid, bistort, and thistle, echo this theme of marriage and procreation: they were acclaimed in the Middle Ages as fertility aids for both men and women. Even the little frog, nestled among the violets at the lower right, was cited by medieval writers for its noisy mating. What the Met notes don't point out is the importance of the pomegranate in Christian symbolism (generally called iconography). Both Leonardo da Vinci and Alessandro Botticelli portrayed the Madonna and child with a pomegranate. 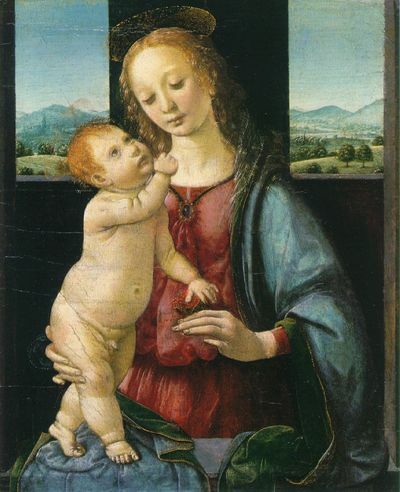 In the Da Vinci below, the Madonna is holding the pomegranate. In the Botticelli, the Christ child holds the pomegranate along with Mary. In Christian symbolism, the pomegranate is a sign of the Passion followed by the Resurrection. This derives in part from the ancient Greek and Roman fertility myths (Ceres and Persephone), and in part from the red juice of the pomegranate, which resembles the blood spilled on the Cross and then provides sustenance to believers. In modern times the pomegranate still holds strong symbolic meanings for the Greeks. On important days in the Greek Orthodox calendar, such as the Presentation of the Virgin Mary and on Christmas Day,, it is traditional to have at the dinner table "polysporia", also known by their ancient name "panspermia" in some regions of Greece. In ancient times they were offered to Demeter and to the other gods for fertile land, for the spirits of the dead and in honor of compassionate Dionysius. In modern times the symbolic meaning is assumed by Jesus and his mother Mary. Pomegranates are also prominent at Greek weddings and funerals. When Greeks commemorate their dead, they make "kollyva" as offerings that consist of boiled wheat, mixed with sugar and decorated with pomegranate. It is also traditional in Greece to break a pomegranate on the ground at weddings, on New Years and when one buys a new home for a house guest to bring as a first gift a pomegranate which is placed under/near the ikonostasi, (home altar), of the house, as it is a symbol of abundance, fertility and good luck. Pomegranate decorations for the home are very common in Greece and sold in most homegoods stores. Thanks Nurse Myra. I've just taken a look at your site, and I love it too. Just put you on my blogroll.